The central scene in this engraving (left) faithfully reproduces an engraved vignette that depicted a method of drawing a silhouette. The vignette was printed in the second volume of Johann Caspar Lavater’s treatise on physiognomy, Physiognomische Fragmente, zur Beförderung der Menschenkenntniss und Menschenliebe published in Leipzig between 1775 and 1778. A draftsman sat behind a movable standing frame which held a sheet of glass and that leaned against the shoulder of the sitter. 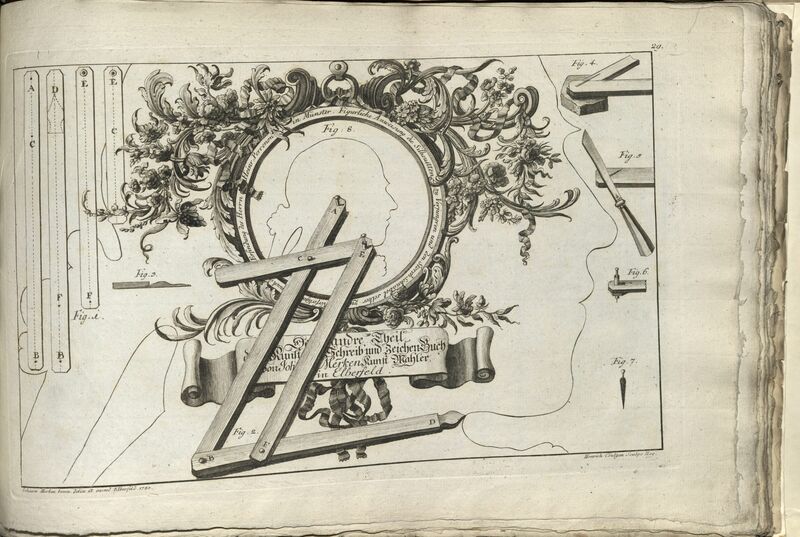 The draftsman drew the outline of the sitter’s profile on a piece of translucent, oiled paper placed on the frame. A stick of wood or iron attached to the middle of the frame supported the sheet of glass and could be moved by the draftsman. 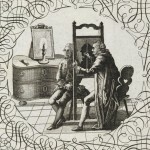 This depiction was later adapted and engraved by Thomas Holloway for the English edition of Lavater’s book (above) but inaccurately represented the draftsman standing behind the frame. To return to the present plate, its caption validated silhouettes as a form of portraiture by assuring viewers that they produced the most faithful representations of the human face. It also gave full credit to its source—Lavater’s work, which was then extremely popular. 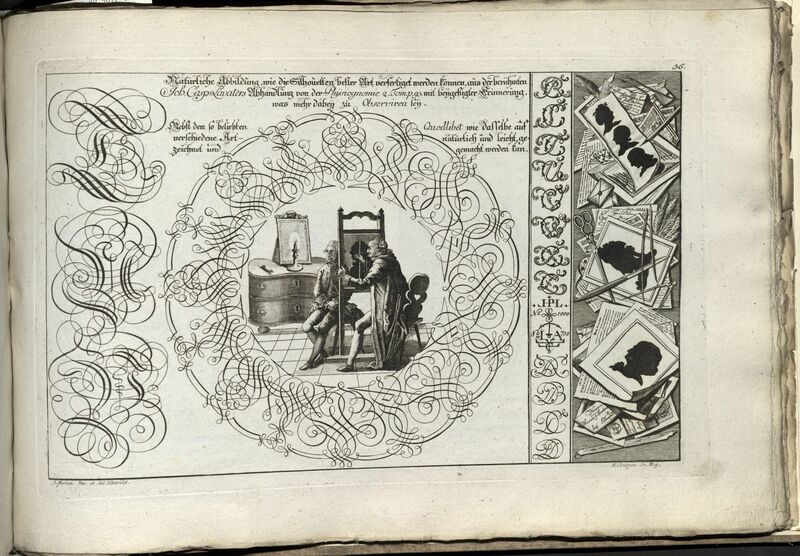 Moreover, the flourishes surrounding the scene, the ornamented letters on the right and left, and the publication of this engraving in the manual of the writing master and self-described “artistic painter” Johann Merken [TypW 720.82.567] indicate that this plate was not so much about giving instructions on how to draw silhouettes but rather about to whom one should go to have one’s silhouette made. Little is known about Merken. He seems to have practiced his art in Elberfeld in the Northern Rhine region and to have published a writing book in two parts in 1782 and 1785. Merken was therefore a contemporary of Lavater and obviously was quite taken by the prospect of drawing silhouettes: he could now add the activity of silhouettist to his other skills, as well as adding his newly-made silhouettes to the pile of his works. His book was partly a writing, partly an art manual, and included different “hands” or styles of writing and various ways of representing human emotions. Lengthy textual sections preceded each suite of plates, intending to educate the readers—both young and old with an interest in art—and summarizing histories of handwriting and art, as well as theories of color and proportion. Merken also included examples of art collecting and reproduced the catalogue of the Dutch art collector Gerrit Braamcamp’s Wunderkammer, sold in Amsterdam at the collector’s death in 1771, and the list of the art works in the castle of Dusseldorf. Silhouettes were collectible too. More importantly for this author, though, they could be rendered faithfully by a writing master used to tracing outlines calligraphically. 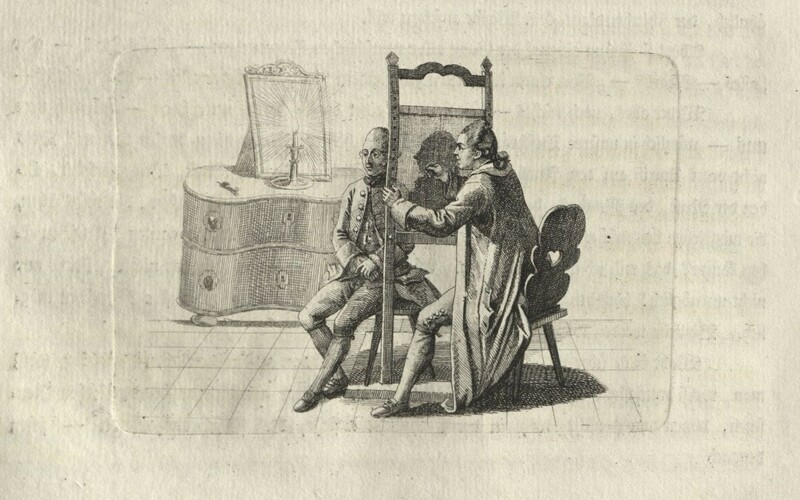 In the end, they were included in Merken’s book to promote his talents at drawing them either by using Lavater’s chair or a pantograph—another instrument often used to draw silhouettes. 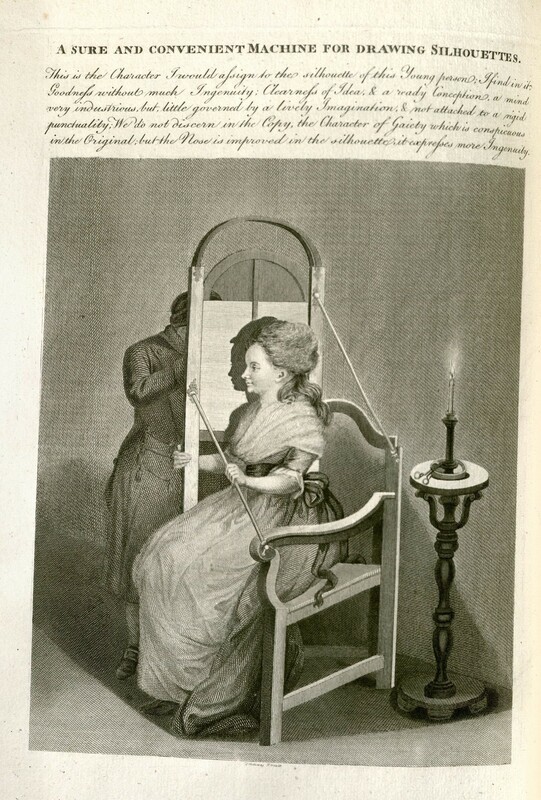 This blog post was written in relation to the exhibition “Silhouettes: from Craft to Art” that has just opened at the Houghton Library (for more information go to: http://hcl.harvard.edu/info/exhibitions/…).